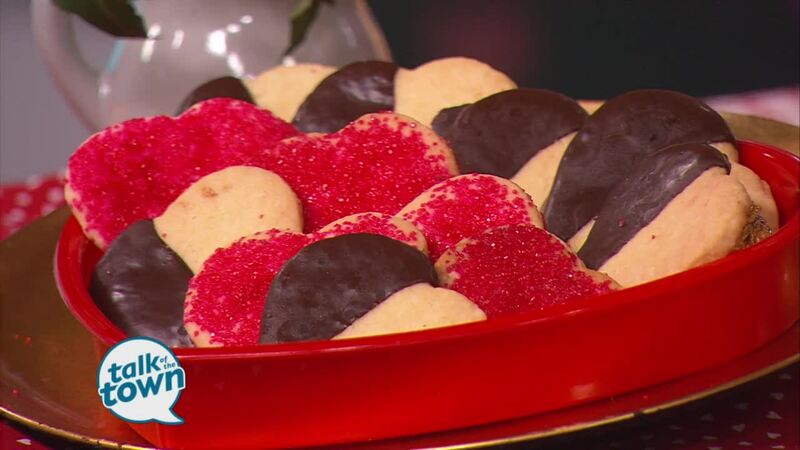 Lynne Tolley from Miss Mary Bobo's made Shortbread Heart Cookies. (see recipe below) For more information about Miss Mary Bobo's Boarding House in Lynchburg, or to make reservations, call (931)759-7394. 1. Place all the ingredients in a food processor and blend until it forms a dough. 2. Turn out onto a well-floured surface and form into a disk. 3. Refrigerate the dough for around 15 to 30 minutes before rolling it out on floured surface and cutting into shapes. Chilling helps to keep it from spreading in the oven. 4. Cut into shapes with a heart cookie cutter. Remove cookies with floured spatula. 5. Carefully place on a parchment lined baking sheet. Bake in a preheated 325 degree oven until cooked through and slightly stiff in center, but not browned, about 20-30 minutes. 6. Remove from oven and cool before eating. Cookies can be covered with colored sugar crystals before baking. Half of hearts can be dipped in melted chocolate, if desired.